Ron Hock has earned an international reputation for the quality of his plane blades. Using the same basic principles that made 19th Century edge tools so great, Ron Hock is carrying on this tradition of craftsmanship in the 21st Century. Using a premium grade of high-carbon tool steel and A2 cryogenically treated steel, Ron Hock crafts a line of replacement plane blades for Stanley style woodworking planes. 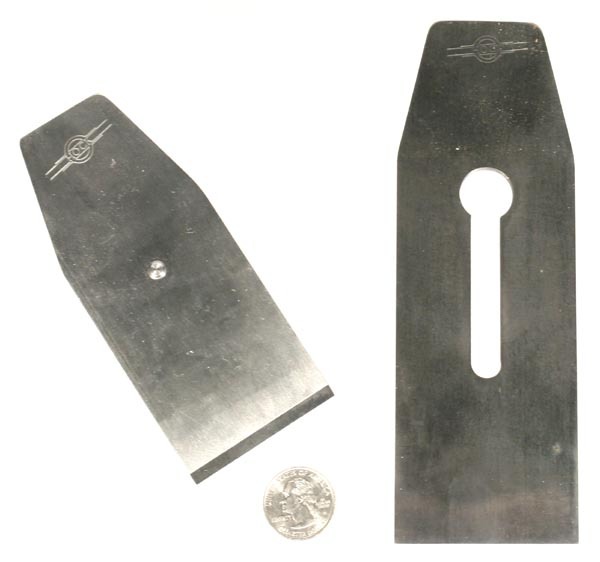 Of course, you can use these plane and spokeshave blades in your own special projects as well. We guarantee that you will find Hock plane blades to be significantly better than most original equipment plane irons. We also offer an exclusive line of Ron Hock parallel irons made specifically for infill planes such as Norris and Spiers planes. This line is available only at The Best Things. All new bench plane blades that are sold today, whether they be from Ron Hock, or with a new plane, will come ground straight across. This is not because a plane iron should be ground straight across. It is because that is how the machines used by the manufacturers grind blades. In reality, the way that a bench plane iron is ground depends on the type of plane that it is being used in, such as a smoothing plane, jack plane, or jointer. 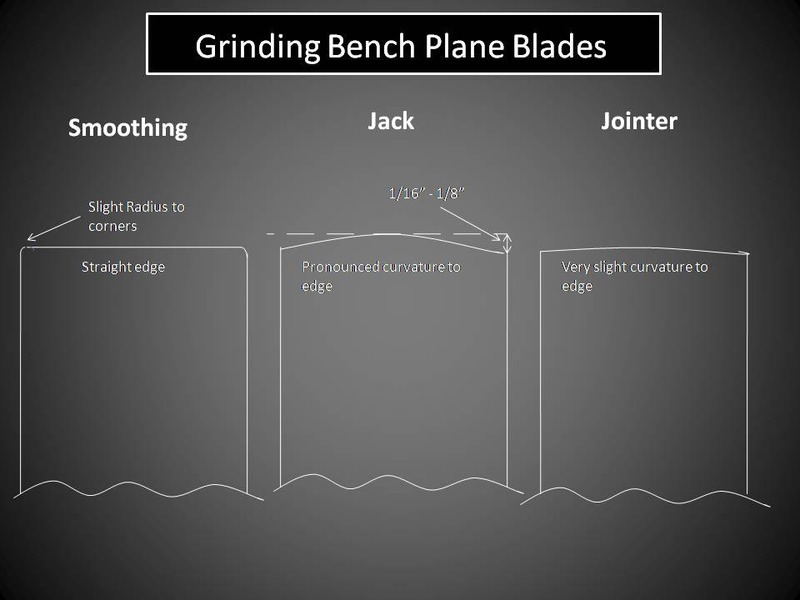 We have created the following graphic to show customers how plane blades should be ground. Some Hock blades are Made in the USA, but the most popular Hock blades are now outsourced to France. Our Hock infill plane blades are all made in Ron Hock's own factory in California. BP175 - Fits #3 Bailey style 1-3/4" SALE! BPA175 (A2 Steel) - Fits #3 Bailey style 1-3/4" SALE! BPA200 (A2 Steel) - Fits #4 & 5 Bailey style 2" SALE! BP262 - Fits #8 Bailey style 2-5/8" SALE! BPA262 (A2 Steel) - Fits #8 Bailey style 2-5/8" SALE! Rabbet (Rebate) Plane Blade 2-1/8" SALE! BLA138 (A2 Steel) 1-3/8" SALE! BWA138 (A2 Steel) 1-3/8" SALE! BWA162 (A2 Steel) 1-5/8" SALE! Fits Record and Stanley #151 and #51. SP175Fits Stanley #51 1-3/4" SALE! Designed to be used with a wooden spokeshave that you will make yourself. Includes brass thumbscrews for adjustment. SP062 Cutter Width: 2 3/4" SALE! Fit #80 and #81 cabinet scrapers, and #12, #12-1/2, #12-3/4 veneer scrapers and #112 scraper planes. SB080 2-3/4" 3" 1/16" SALE! SB112 - Fits Stanley #12, 12-1/2, 12-3/4, 112 and clones. 2-7/8" 5" 3/32" SALE! BR375 This is just a Hock burnishing rod. It does not come with a handle. Measures 6" by 3/8" long. A hole is drilled in one end to facilitate adding a handle. SALE! BR375HP Hock Burnisher fitted with a premium quality cocobola handle. This is the connoisseur's burnisher. SALE! The Hock Layout Knife comes to a point in the center, but is bevelled on one side only, allowing it to draw lines in either direction, while held tight against a straight edge. Knives of this style, with wooden handles, were used by the old masters. Ron has left it to you to make a handle. MK025 - 1/4" x 7" SALE! Designed by the late violin master, Hans Weisshaar, these blades are beveled on both sides and are designed to be used with a handle that you must make. VK025 1/16" X 1/4" X 7", tip at 10 degrees SALE! VK050 1/16" X 1/2" X 7", tip at 25 degrees SALE! VK075 3/32" X 3/4" X 7", tip at 25 degrees SALE! VKSet Set of all three SALE! We stock parallel (refered to as gauged by the British) irons custom made for us by Hock. Original irons were hand made and individually fitted when new, which is why many manufacturers numbered the irons to the plane. Our Hock irons are available in 5 widths and 2 thicknesses in both standard and A2 versions. These should cover most every plane out there, but in some cases will require some fitting on your part. If you desire a very tight mouth, you will probably need a 3/16" iron, and if it is too thick, you will have to remove some metal from the back of the iron with a belt sander or grinder. These irons are very hard and that could be a tedious process. For Norris and Other Infill Type Planes. YB250 2 1/2" 3/16" SALE! YBA250 (A2) 2 1/2" 3/16" SALE! YBA250X (A2) 2 1/2" 5/32" SALE! Ron Hock custom makes replacement chip breakers for infill planes, loosely based on a Norris pattern. They do not have the decorative chamfering found on an original Norris iron, but they are cut to the shape of a typical Norris chip breaker. NOTE: Our Hock chip breakers are not intended for use on ajdustable Norris planes. The cap iron screw on an adjustable Norris is closely fitted to the adjuster. The screw on these will not fit. YBK212 2 1/8" 1/8" SALE! YBK225 2 1/4" 1/8" SALE! YBK250 2 1/2" 1/8" SALE!